april 2005 | 153 blz. The European Court of Human Rights received tens of thousands of applications per year. The answer by the Member States of the Council of Europe to this dramatic development is Protocol No. 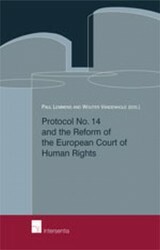 14 to the European Convention on Human Rights, signed on 13 May 2004.